Scott Peterson's preliminary hearing in the killing of his pregnant wife Laci and their unborn son has been postponed until September. The judge today set a hearing scheluded for Sept. 9, after prosecutors said witnesses wouldn't be available next month. District Attorney James Brazelton is seeking to have the preliminary hearing held in open court instead of before a secret grand jury. He says that would dispel rumors and, in his words, "open some eyes." If the September hearing remains public, it will be the first time the case has been discussed in open court. 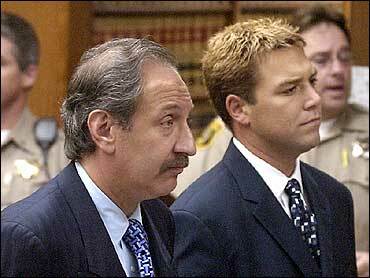 Other issues at Thursday's hearing will include wired tapped recordings from Scott Peterson's telephone, defense attorney Mark Geragos' contempt-of-court accusation against the district attorney and the lawyer for Scott Peterson's ex-mistress. Geragos says District Attorney James Brazelton and attorney Gloria Allred violated the judge's gag order by talking to the media. He has asked a judge to lift his gag order, saying it is unconstitutional and one-sided. Also, media companies will ask the judge to unseal Peterson's arrest warrant. And the judge will address a dispute over phone calls between Peterson and his lawyer that were monitored by police, a step the defense believes violated attorney-client privilege, reporter Gloria Gomez of CBS affiliate KOVR, told the CBS News Early Show. Geragos said Allred, who represents Amber Frey, violated the gag order five hours after it was issued by discussing his tactics on the Fox News Channel's "On the Record." Allred said Monday that the order bars potential witnesses, such as Frey, from commenting, but does not apply to lawyers for witnesses. "I think that this is an attempt to silence me. And there is no merit to the argument that they're making," Allred said. "The protective order clearly does not cover me, and Mark Geragos knows that because he has received a copy of it. "This tactic appears to try to deflect attention away from his client who is charged with a double homicide and put others on trial instead," she said. Brazelton was quoted in the Modesto Bee as saying prosecutors at Scott Peterson's preliminary hearing will let the public see evidence "that might open their eyes." Whether a preliminary hearing will be held next month is also expected to be discussed Thursday. Stanislaus County Superior Court Judge Al Girolami issued the gag order last Thursday, aiming to more prevent leaks, speculation and rumors that could jeopardize Peterson's right to a fair trial. Geragos filed his papers late Friday. Girolami cited widespread publicity about the case in issuing his order. Without it, the judge said "rumors and gossip would be rehashed shortly before trial thereby making it extremely difficult to select a fair and impartial jury." Prosecutors had asked for a limited gag order. At the time, Geragos responded that such a ruling would harm his ability to defend his client. "The people who actually know what the facts are end up kind of being muzzled, if you will," he said. Allred also opposed the order, as had an attorney representing newspapers and broadcasters. Scott Peterson, 30, faces the death penalty if convicted of the murders of Laci Peterson and their unborn son. The fertilizer salesman has pleaded innocent and Geragos said he is seeking the real killers. The remains of the 27-year-old substitute teacher and her unborn son washed ashore in San Francisco Bay in April near where her husband said he was fishing on Christmas Eve when she disappeared.